Dennis Carl Wilson (December 4, 1944 – December 28, 1983) was an American drummer, singer and songwriter. He is best known as being one of three brothers in the rock band, The Beach Boys. Wilson was a member from the beginning until he died in 1983. The group made twenty-four studio albums. Wilson made one solo album, Pacific Ocean Blue. It stayed popular with critics over the years. Dennis was born in Inglewood, California. He was the only surfer of the group and he lived the beach lifestyle that the Beach Boys wrote about in their songs. In 1968, Dennis Wilson met a musician, Charles Manson, who had a group of followers in a religious cult. His cult members were called "The Family". Wilson became very fond of Manson and his friends. They all moved into his home on Sunset Boulevard in west Los Angeles for a few months. At first, Wilson was writing some songs with Manson, who could play a guitar. Thinking he had talent, he introduced him to a few friends in the music business, including Terry Melcher, (the son of Doris Day). But he soon became afraid of Manson's bad temper and violent behavior. So finally Wilson escaped by just moving out of his house and leaving Manson there. Manson was actually a dangerous and mentally ill criminal. In 1969, with the help of "The Family", he murdered at least eight famous people in California. On December 28, 1983, while partying soon after his 39th birthday, Wilson drowned at Marina del Rey in Los Angeles. He had been drinking alcohol all day and diving into the sea in the afternoon. He was buried at sea off the California coast by the U.S. Coast Guard on January 4, 1984. President Ronald Reagan allowed the burial. ↑ Thom Jurek. 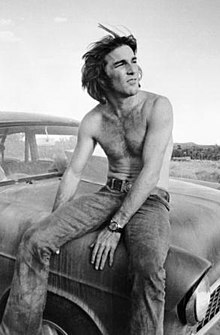 "Dennis Wilson Pacific Ocean Blue". Allmusic. Retrieved 1 February 2015. ↑ 3.0 3.1 Bugliosi, Vincent; Gentry, Curt (1994). Helter Skelter: The True Story of the Manson Murders. W. W. Norton & Company. ISBN 978-0-393-08700-0. ↑ "Reagan Helps Get Approval For Musician's Burial at Sea". nytimes.com. UPI in The New York Times. January 3, 1984. Retrieved February 1, 2015. This page was last changed on 5 October 2018, at 18:53.